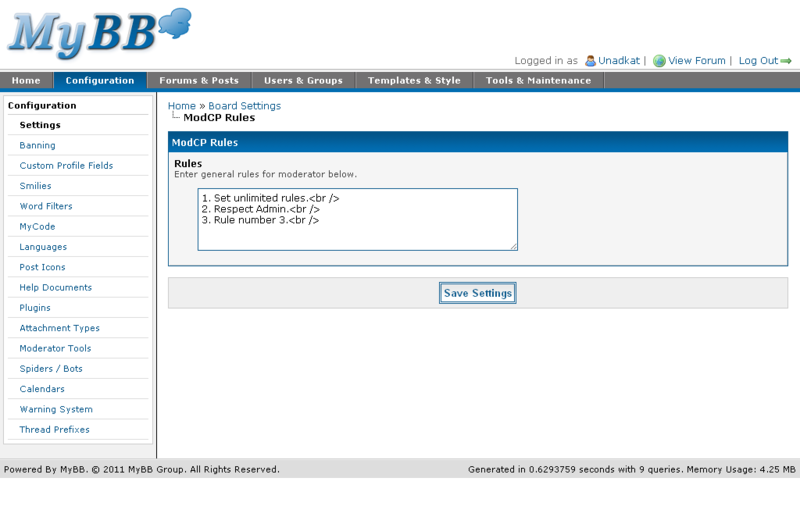 Description: ModCP Rules is a simple & new concept based plugin which allows you to add general rules box to all moderators visible in ModCP. I find it very useful for my own forum IMHO, especially when there are new moderators, instead of making conversations with every STAFF member, this simple mod allows you to hook up rules, guidelines or even upcoming changes and notifications to staff member, whatever you want. 2. Upload mcpr.php inside the inc/plugins/ folder which we just extracted now to (root)./inc/plugins directory of your website's server. 3. Go to ACP > Plugins and find ModCP Rules setting and activate it. 4. Next, proceed to ACP > Settings > Configuration and find ModCP Rules settings and add your rules in the texbox and click save settings. 5. To display rule one below another in separated lines, enter <br /> to the very end of each rule. 5. Done, when you'd go to modcp.php you'd find rules there (see screenshot at bottom) , enjoy.